I read a blog post by a high school freshman with interest: Good Teaching Happens When Students Can Trust Educators. Before I read the post, I wondered if a more appropriate title might be "Good Learning Can Happen When Students Trust Educators." Garrett, the student writer, speaks of Mr. McCoy with whom students could be open without fear of judgment, but who also knew they needed to listen to his counsel and be respectful. The essence of Garrett's essay is mutual respect. Educators respect students and can expect the respect of the students. Trust and respect are earned, and must be earned again when lost. I've seen the equality vs. justice images make their rounds through social media. 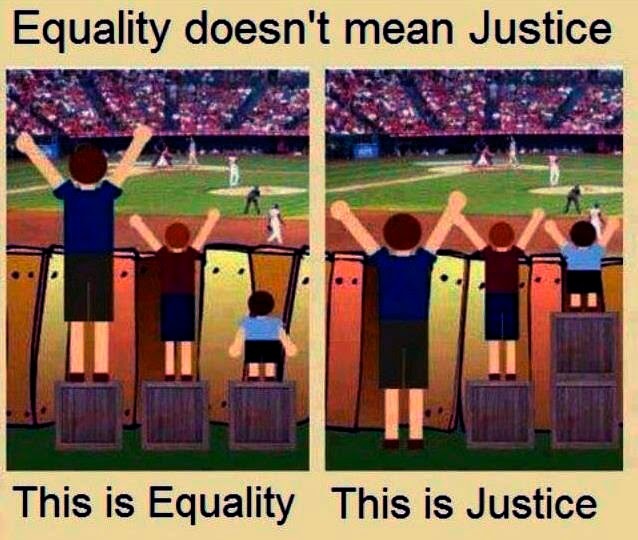 I agree that equality is not the same as justice; I also think this image oversimplifies "justice" but the point is clear. The same might be said of how educators treat their students. Treating our students equally is not the same as treating them equitably. Students who work on a class project want to be graded fairly or equitably, not equally. If one student works 15 hours on a project and does an adequate job, another student works 15 hours on the same project and does an amazing job, and yet another student works only 7 hours on the same project and does a good job, then equal grading will not make them happy. You can hear the chorus of "It's not fair!" even now. But if you grade them equitably, you grade them according to the quality of each individual's work. That is fair; it might even be just. I think educators need to treat all students with equal respect. I believe educators need to be equally patient and creative with all students. I don't believe every student should have equal opportunities to succeed because every student does not learn the same way, does not have the same skills or knowledge base, does not have the same capabilities nor the same aptitudes. So I believe that we need to offer students equitable opportunities to succeed. I also believe we need to offer students the same options for equitable opportunities. That is, while I might ask students to approach a task in a particular way, I offer every student the option of approaching the task in a way that makes sense to them. I can't offer options only to my favorite students (we all have them) or to the students I think are most likely to do a good job or be sufficiently creative or whatever my filters might be. In other words, I have to trust that my students will rise to the occasion. And when they struggle, because some of them will struggle, I have to be ready to offer each and every one of my students the same level of care, trust, and respect; I have to offer the same level of belief in them and their abilities.